A mum-of-two was called ‘clumsy’ for 27 years after dislocating thousands of times finally gets a diagnosis. 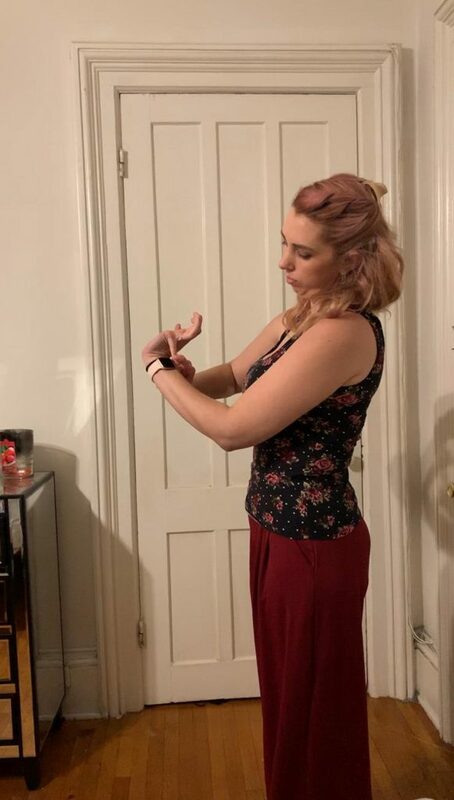 Thea Smuckler, 29, from Goshen, New York, USA, was finally discovered to have Ehlers-Danlos Syndrome (EDS) after a physician friend noticed she was abnormally flexible. The disorder affects the connective tissues that support skin, bones, blood vessels and more, meaning that the slightest movement can cause her to dislocate. She was under two when doctors first had to pop her shoulders back into place and growing up never spent a summer without a cast. Her unusual ailments were believed to be because she was ‘lanky’ and ‘clumsy’. She has suffered thousands of dislocations over her lifetime, occurring up to five times a day and affected nearly her entire body. Everything from chewing to walking down the stairs and carrying groceries can cause her joints to misalign. 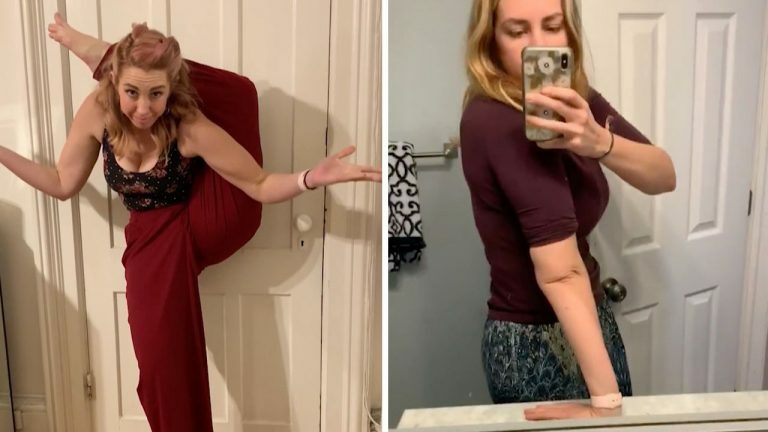 Previously, Thea believed her flexibility was just a quirky party trick – with her able to bend her finger back to her arm, put her legs behind her head and hop, and more. On the Beighton Scoring System a diagnostic test for hypermobility type EDS, she scored nine, the highest reading. The nurse is now relieved to have a diagnosis after believing her excessive exhaustion, chronic pain and other symptoms, previously believing they were all psychological. Thea said: “I feel so much more hopeful now that I know this is all caused by Ehlers-Danlos Syndrome and not a character flaw. “I felt like I was crazy and a hypochondriac. I felt ashamed of how much I was struggling that I tried to hide it. I felt pathetic and useless. 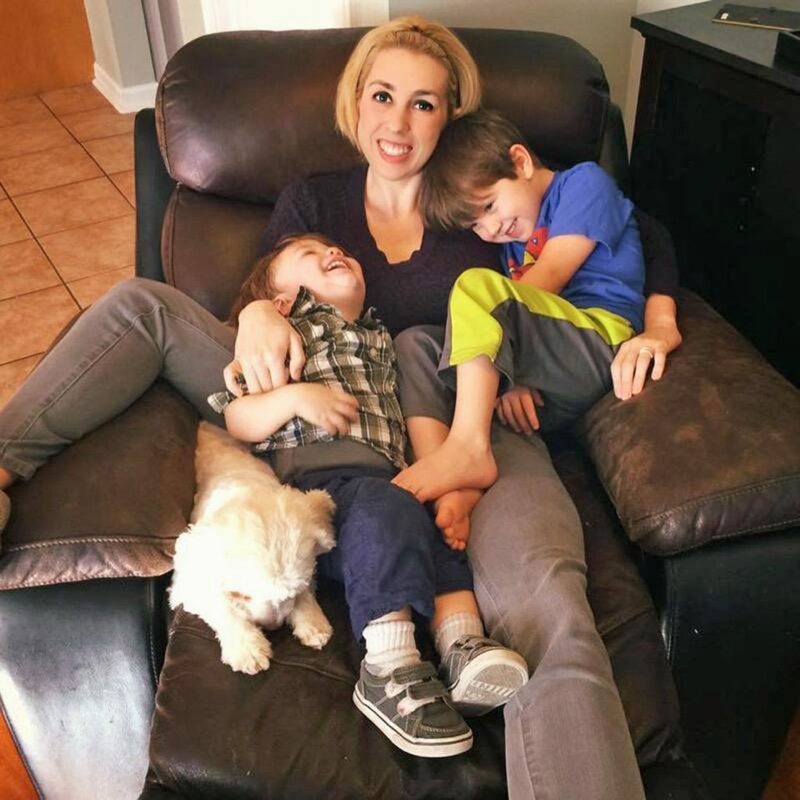 “I was scared of going to see a doctor even when my jaw was locked shut or I had fainted randomly, as all bloodwork and ECGs would come back within normal limits. “Things people can do like carrying groceries hurts my arms and leaves me exhausted, I felt ashamed of how much I was struggling that I tried to hide it. “To friends I would lie and pretend I was working more hours as an excuse for being so tired, as it didn’t make sense to be so low-functioning. “When getting dressed any item where the sleeves are tight can cause my shoulder could pop-out, so I tend to wear a lot of baggy or stretchy clothes. “Walking down the stairs I can guarantee one of my ankles will dislocate and get stuck. It hurts and I have to painfully force the joint back into place. “Our bedroom is on the second floor, so after going upstairs I won’t go downstairs unless I absolutely must. “Some days I have gone all day without eating because I dreaded dislocating while going downstairs. “If I chew something tough my jaw will dislocate and get stuck, it swells up, is very ugly and painful. Thea’s symptoms manifested during childhood, with her regularly having to wear casts to help her heal. Over the years the frequency of her dislocations has increased, and her exhaustion intensified. She was diagnosed with depression to dehydration and prescribed countless medications and yoga without any improvement. Thea said: “From every test I had, I was forever told everything was fine, and that it was depression that left me feeling so exhausted. “I was told I had to force myself better and power through. “I felt like I was a useless human being because everything others found so easy would take a lot of willpower and discipline for me to accomplish. 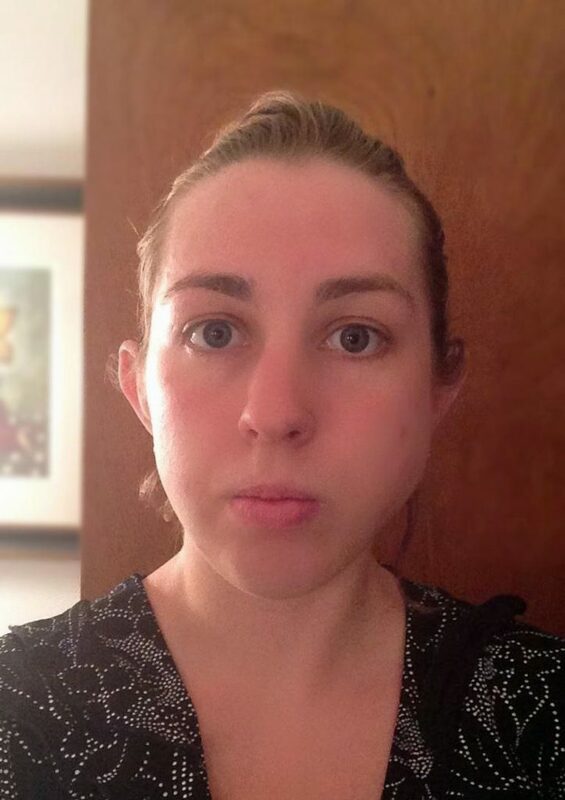 Thea was diagnosed with Temporomandibular Joint Dysfunction while serving in the Marine Corps after dislocating joints following less strenuous activity. She added: “But no one recognized that the joint dysfunctions were widespread. 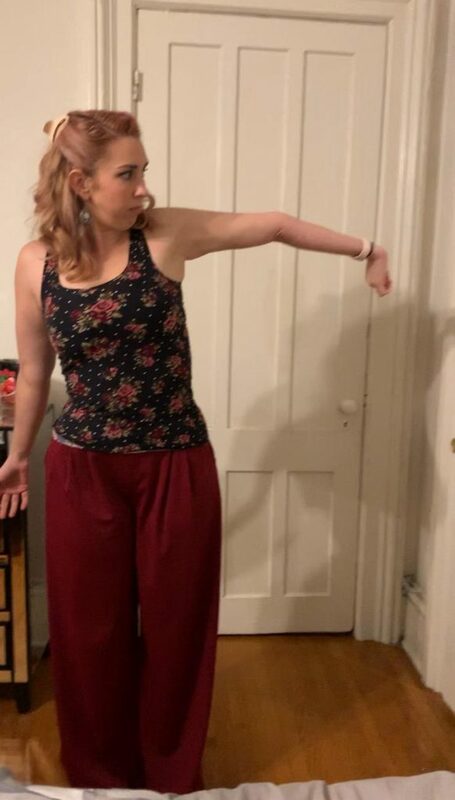 Alongside her Ehlers-Danlos Syndrome diagnosis, she is suspected to suffer from Postural Orthostatic Tachycardia Syndrome (POTS) another invisible illness. 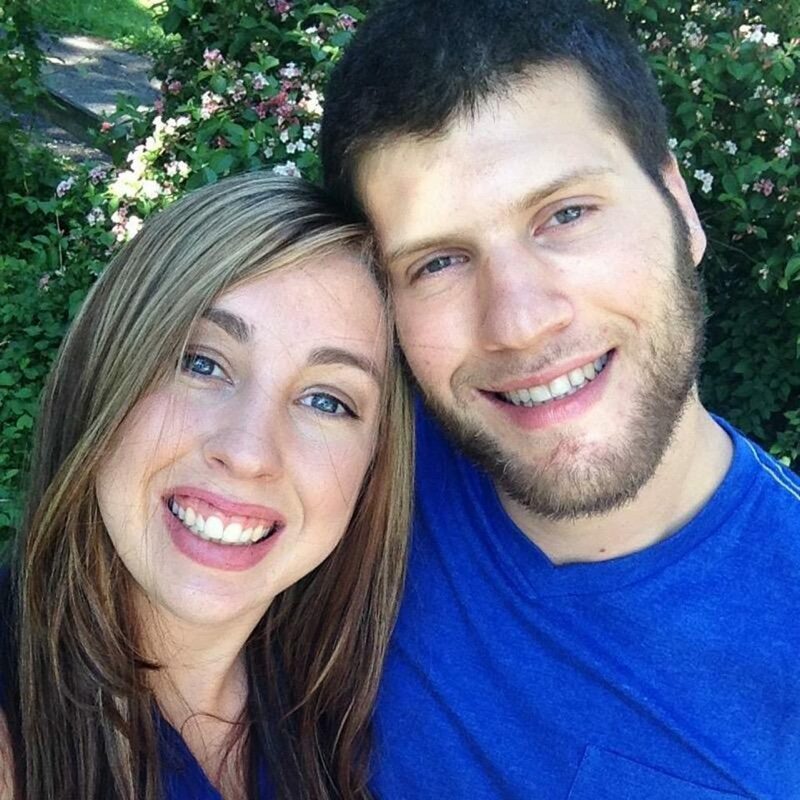 The combined disorders mean she battles chronic fatigue, breathing difficulties and more. Due to having a higher resting heart rate and low blood pressure because of her disorders standing up too quickly or bending over can cause her to go lightheaded and faint. Thea said: “Before EDS I was always tired not matter how much I would sleep. “I need more sleep more to be rested too and often wake up gasping for air. Thea wants to raise awareness of EDS, in the hope that others who recognise similar symptoms can get a quicker diagnosis. She went for 27 years without answers for her unusual symptoms until last month and now is awaiting the results of further genetic testing. Fortunately, the mum is relieved that her sons Lucas and Jack, seven and four, are not exhibiting any signs of the EDS or hypermobility. She reveals the toll invisible illnesses have on her, in the hope it will reduce the stigma surrounding them. Thea said: “I am very embarrassed to ask for help at the store or anywhere because I look so healthy. “I would be too embarrassed to ever use handicap parking so I only go out if my husband is coming too and can drop me off at the door. “I look young and fit and it comes off as entitled or spoiled.